For a brief moment, we are completely alone in this part of the forest. So I stop, close my eyes, and just stand still, feeling the gentle breeze against my face and listening to the wind rustling in the bamboo leaves high above my head. I take a deep breath of the fresh air which smells of the damp forest. Unfortunately, the silent moment only lasts for a couple of minutes before the area is yet again packed with noisy posing tourists snapping selfies. I open my eyes and look up at the sky, admiring the thick green bamboo stalks that seem to continue endlessly up towards the heavens. The light is absolutely beautiful with the sun barely peeking through the bright green bamboo leaves and the stalks swinging in the wind. The wind is making the trunks creak eerily as they collide and twist. I feel like I have entered another world, like a place taken out of the fairy tale of Alice in Wonderland. It feels like a magic forest! If you haven´t decided on where to stay in Kyoto yet, and are struggling with choosing which area of Kyoto to stay in, check out our guide on the best hotels and areas of Kyoto to stay in. 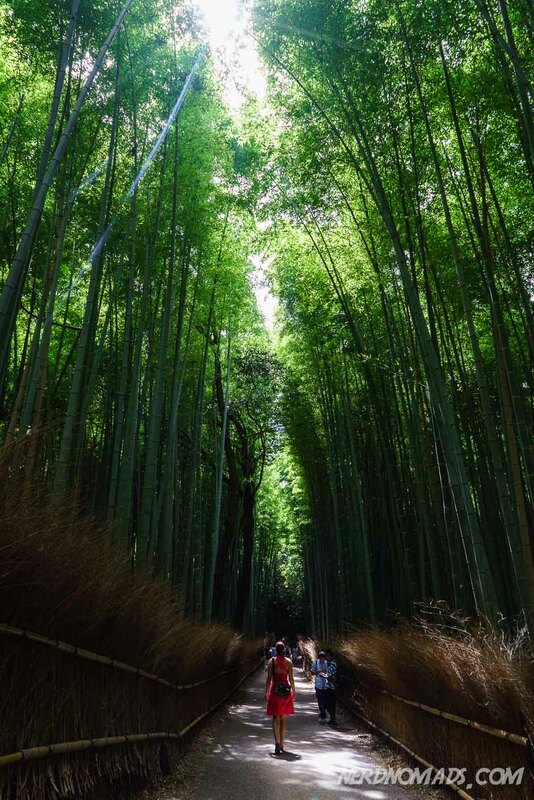 We are visiting Japan’s Sagano Bamboo Forest, in Arashiyama area on the outskirts of Kyoto city, popularly referred to as the Kyoto Bamboo forest. The Sagano Bamboo Forest is one of Japans most popular tourist attractions, and if you are among those who click on articles with headlines like “Places To See Before You Die” or “The Most Beautiful Forests In The World” chances are that you have seen photos of The Kyoto Bamboo Forest as it is usually on those kinds of lists. So the days where you could have the forest for yourself are long gone! The crowds are worst in the weekends when Japanese day-trippers take over the area. Arashiyama area is particularly popular during the spring cherry blossom and fall color seasons. We visited the forest on a Tuesday, at the beginning of August, so it was not too busy. 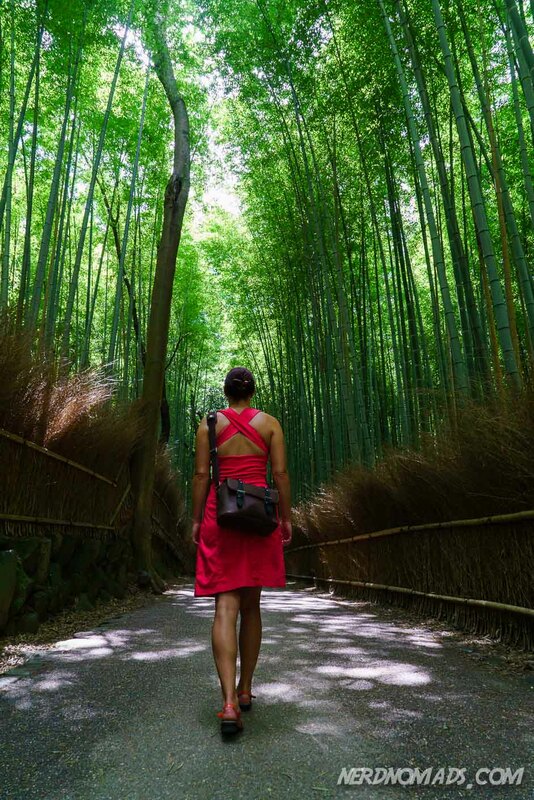 The bamboo grove is easily accessed directly from the main street of Arashiyama (close to the train station), a little to the north of the entrance to Tenryu-ji Temple (exit the north gate of the temple, take a left, and you’ll be in the grove in no time). There is just one main path through the forest, which leads slowly uphill, and is a very easy walk. 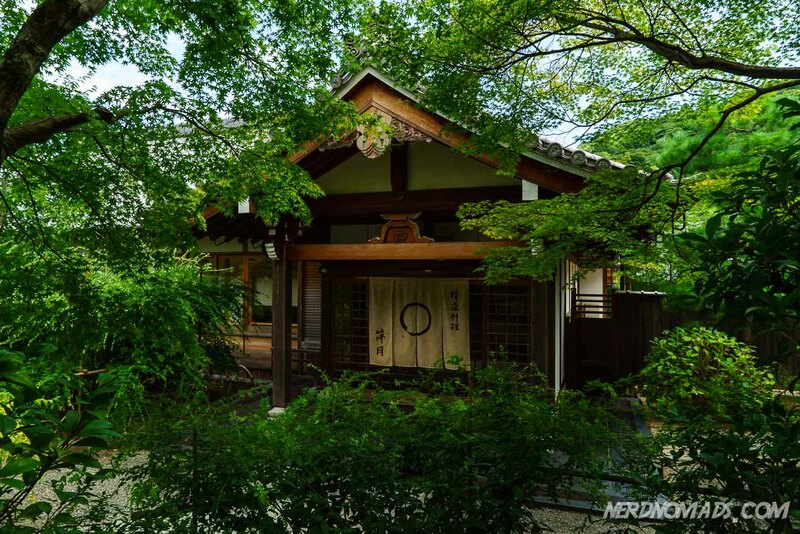 Once you get to the top of the small hill, you reach the entrance to the former villa and garden of the famous silent actor Okochi Denjiro right in front of you. We did however not visit this villa and the garden. The Arashiyama area of Kyoto contains several Shinto shrines and temples, like the UNESCO World Heritage Site Tenryu-Ji temple located right outside the bamboo forest. The temple is also one of the Kyoto-gozan – one of five major temples of Kyoto. 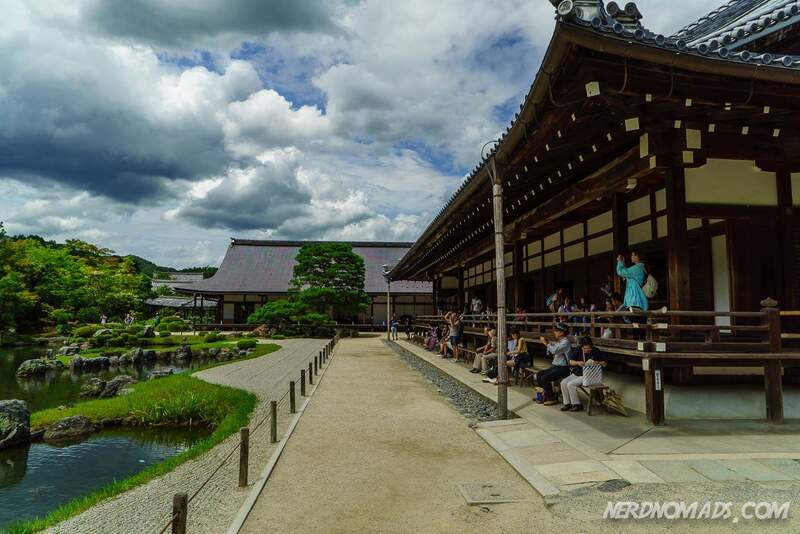 The Arashiyama area consists of seven Shinto temples in total, but unfortunately, we were a bit short on time so we only visited the Tenryu-ji temple. 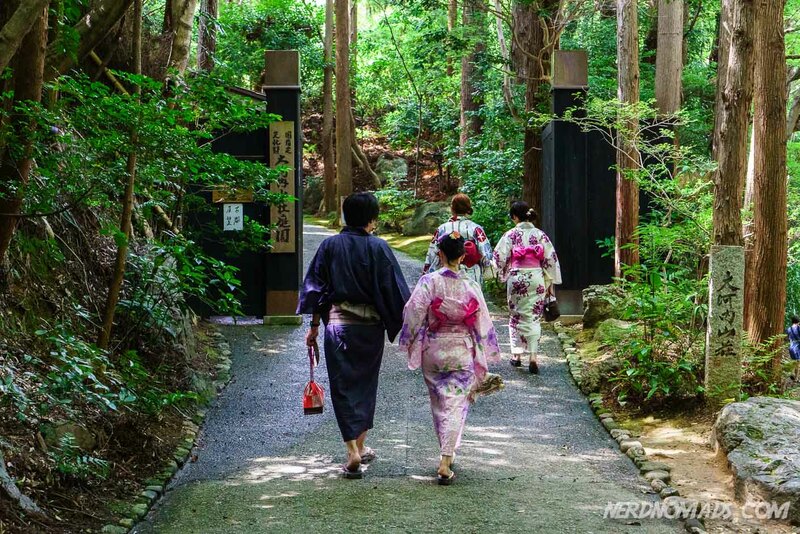 There is no coincidence that so many Shinto temples are located here, as in Japan Shinto shrines and Buddhist temples are often situated near bamboo groves. 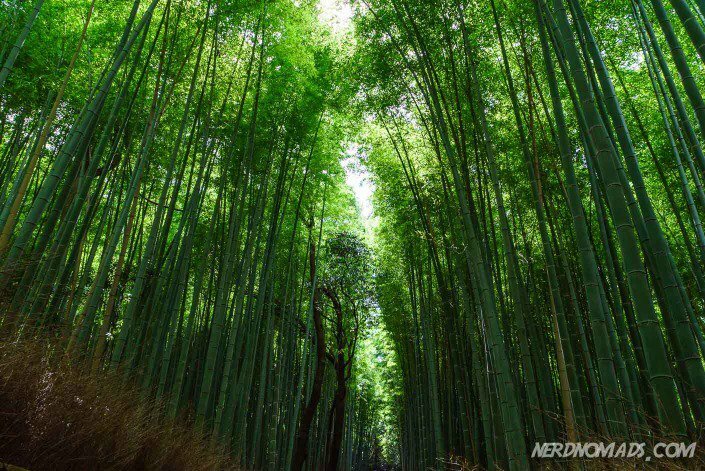 Bamboo forests are viewed as a clever means of warding off evil, while the bamboo itself is seen as a symbol of strength. The Tenryu-ji temple was built in 1339 by a shogun in honor of the passing of Japan’s emperor Tenryu-ji. The temple also has one of Japan’s most incredible Zen gardens and is today the headquarters of the Rinzai School of Zen Buddhism. 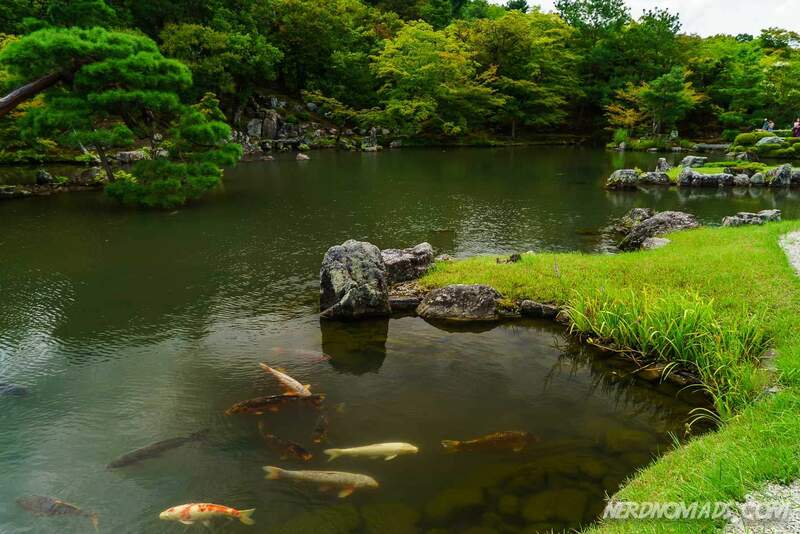 The temple’s exquisite pond garden dates back to the Heian period (794-1185). 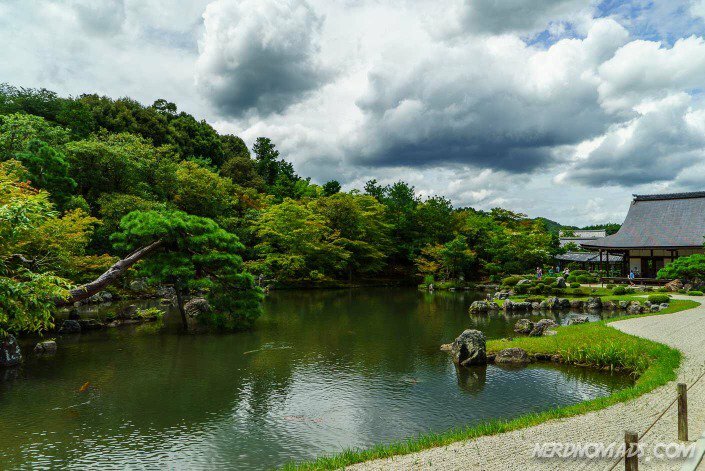 Other attractions in the Arashiyama area includes the Togetsukyo Bridge (also called the “Moon Crossing Bridge”), the former villa and garden of the famous silent actor Okochi Denjiro, and Monkey Park Iwatayama. There is also Saga-Toriimoto Preserved Street with its old traditional townhouses, and the ancient hut of the 17th-century haiku poet Mukai Kyorai – Rakushisha Residence. You can rent a bicycle and go around the area, take a Hozu River Boat Tour and take the Saga Scenic Railway – a 25-minute steam train ride (7 km) through scenic landscape along the Hozu River. 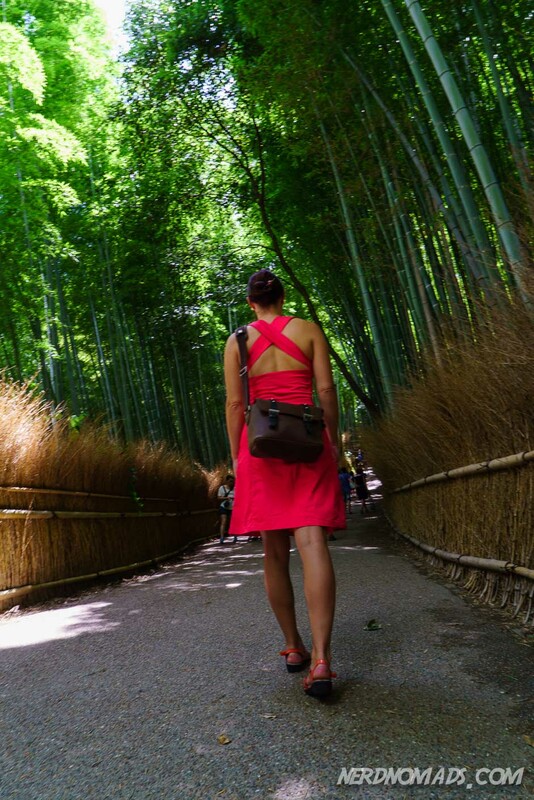 We loved the Sagano Bamboo Grove!! 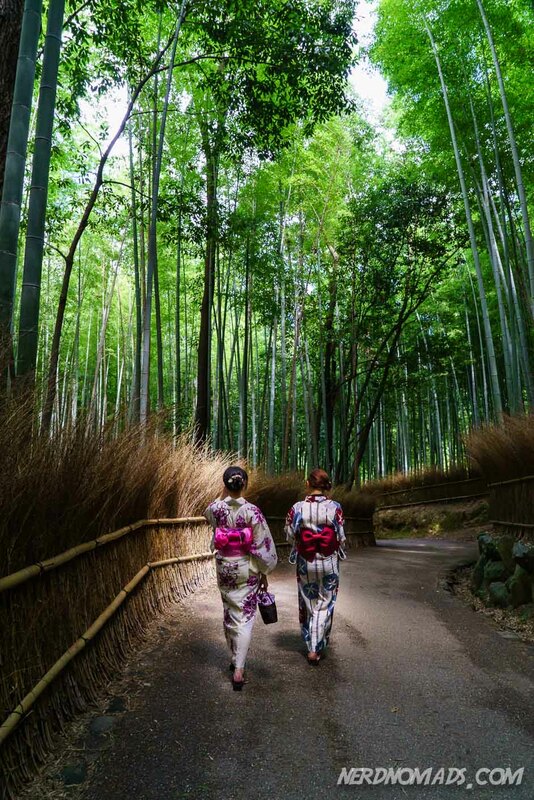 It is one of Kyoto’s and Japan`s top sights and that for good reason – it is really beautiful and standing among these soaring stalks of bamboo is like being in another world! 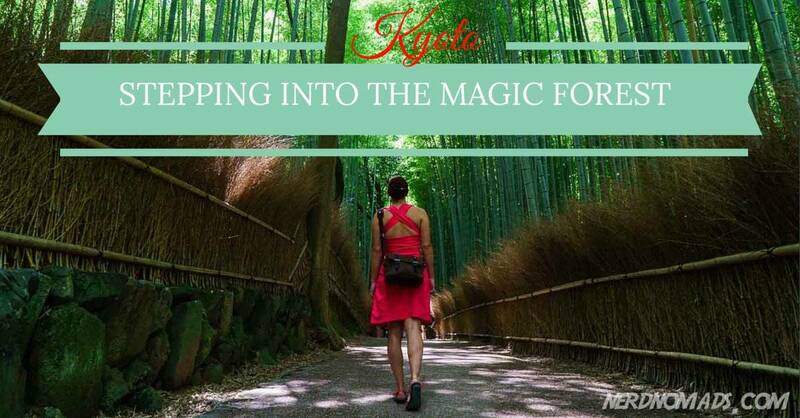 If you are planning a trip to Kyoto, you should definitely visit the Bamboo Forest! Along with the Torii gates of Fushimi-Inari Shrine and Kinkaku-ji Temple, it is one of the most famous sights in Kyoto and for a good reason. Even though there are a lot of stunning pictures out there of the bamboo forest, no picture can capture the feeling of standing in the midst of the sprawling green bamboo grove listening to the wind rustle in the leaves – you have to feel it yourself! How To Get To Kyoto Bamboo Grove? Bus: Kyoto City Bus #28 or Kyoto Bus #71, #72, #73. Bus: Kyoto City Bus #28 or #11 (#11 also can be caught from Shijo Kawaramachi). 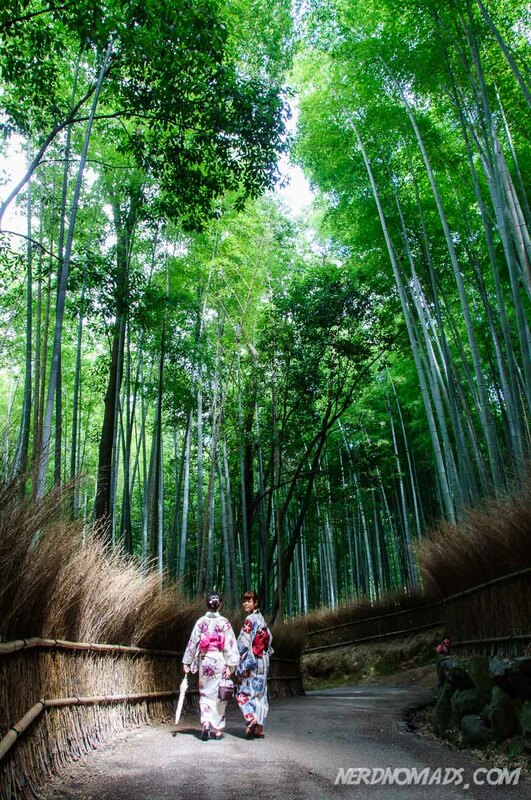 How Much Does Kyoto Bamboo Grove Cost? Entering the Bamboo Grove Kyoto is free. There are several temples in the area, which have entry fees. 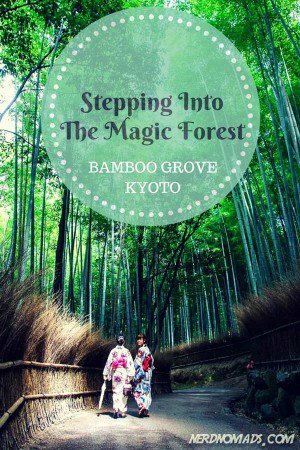 When Is The Kyoto Bamboo Grove Open? 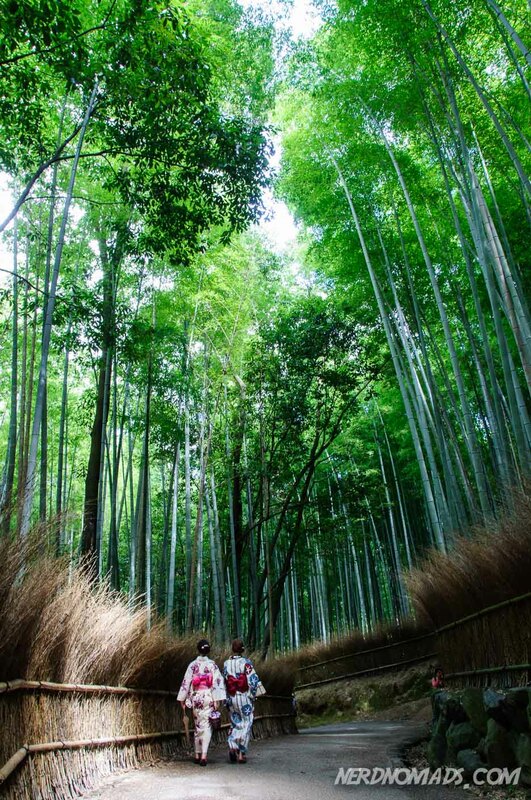 The Sagano Bamboo Forest never closes and is open 24/7. Tenryu-ji Temple is open daily, 8:30 am. – 5:30 pm. Kyoto has a lot of accommodation options to choose from in many different areas of Kyoto. Click here to read our complete guide to our favorite Kyoto areas and hotels. We highly recommend this hotel, as we loved it! The best hotel we stayed at throughout our entire Japan trip! The rooms are big and beautiful decorated, with huge comfortable beds. Great service from the staff and excellent location just next to Kyoto Train Station (100 m walk). 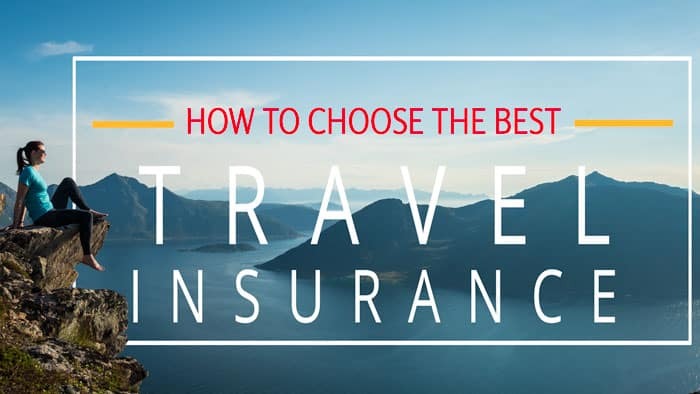 You will love this hotel! 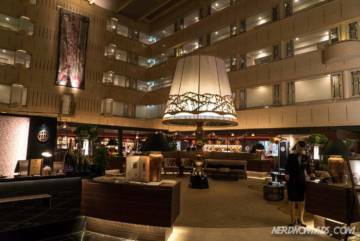 We stayed at Hotel Mystays in Tokyo and it was fantastic! Hotel Mystays is a business hotel chain. The rooms are not the biggest but have everything you need and more (even slippers!). The location of Mystays Kyoto is perfect, close to Maruyama park and many shrines, and very close to a subway station (300 m) and bus stops. There is a good selection of restaurants nearby and there is a supermarket next to the hotel. It is a quiet hotel, and all rooms have good wifi. There is a laundry room with washing machines and dryer and a coffee machine in the lobby that you can use for free. A nice budget hotel centrally located with plenty of eating places within a short walk. It is within walking distance to the Gion area and to Nishiki market. Reasonably sized rooms (big for Japan) and have a small fridge and coffee/tea maker. The breakfast is delicious. The bathroom is fully equipped with all the necessary toiletries. There is a Starbucks next to the hotel, and the hotel is close to a big supermarket, many restaurants, as well as bus stops and a subway station (2 stops from Kyoto Station). Take subway Karasuma Line to Shijo Station (exit 6). I was about to visit bamboo forest when I was in Kioto, but unfortunately there was not enough time to see everything so I needed to choose something (and I decided to go to Hiroshima by shinkansen on that day). Wow. I have seen photos of this once before, but yours are so lovely. 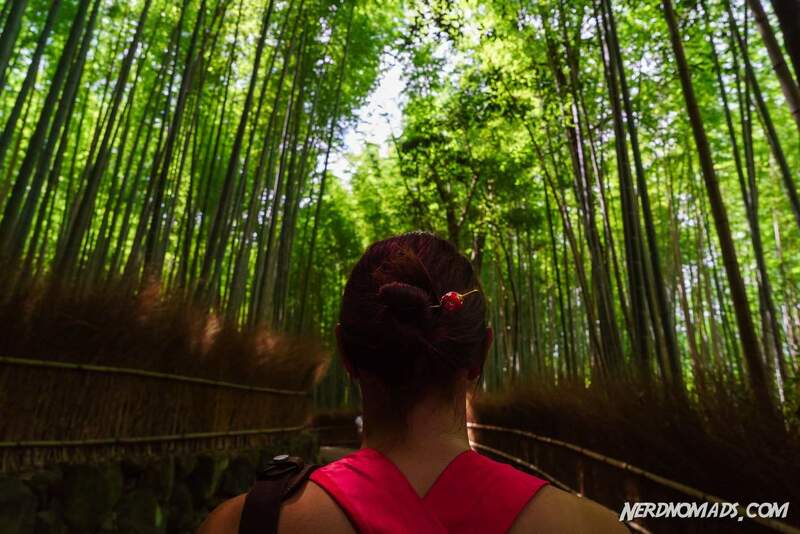 Now I have to add the Kyoto Bamboo Grove to my bucket list! I would just like to stand there and listen to the bamboo for a while, if I can sneak away from all the tourists. Thanks Rhonda!!! So glad you like our photos!!! 🙂 The Bamboo Forest in Kyoto is really special, we loved it! Listening to the bamboo swaying in the wind is a must-try-zen-moment!! 🙂 You will love it! Just try to avoid going there in the weekends. During the cherry blossom season (April, May) and autumn (September, October) this area gets packed with people. It is also more quiet there in the early morning and late afternoon. I was actually disappointed when I went. I thought it was would be bigger and less paved road-y. Also it was packed with people. I did make up for it when lots of green tree soft-serve though. Ah, such a shame that you got disappointed and didn`t enjoy it! It was actually not so crowded when we were there, but we avoided the weekend and did visit Japan in the off-season (July-August). We also went there in the afternoon. Our disappointed moment in Kyoto was the Kinkaku-ji Temple (Golden Pavilion). It was just too crowded and people were really pushy and rude in order to get the perfect selfie. Not fun at all! That’s funny because I actually liked that temple out of all the ones I saw. Or at least, I got better pictures from it. I loved your pictures! 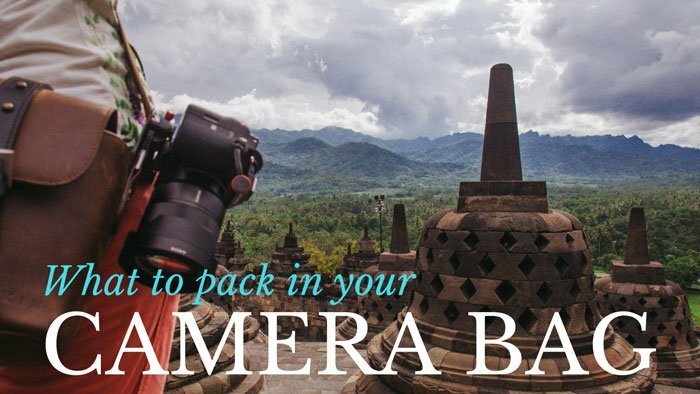 Thansk for so many useful tips for a visit to Japan. Enjoy and I hope you will have a great time further on as well. Tusen takk Bente!!! 🙂 Japan er et fantastisk land å reise i!! Så mye å se og oppleve, og veldig lett å komme seg rundt for det går alltid et tog. Anbefales! Herlig! Det ser utrolig vakkert ut. Har sett stedet før på bilder fra slike lister du nevner 😉 Synd at det er så folksomt der, men slik skjønnhet har jo dessverre oftest en pris. Wow, this looks really amazing!! Thanks Esther!! 🙂 It really is an amazing forest, kind of magical! 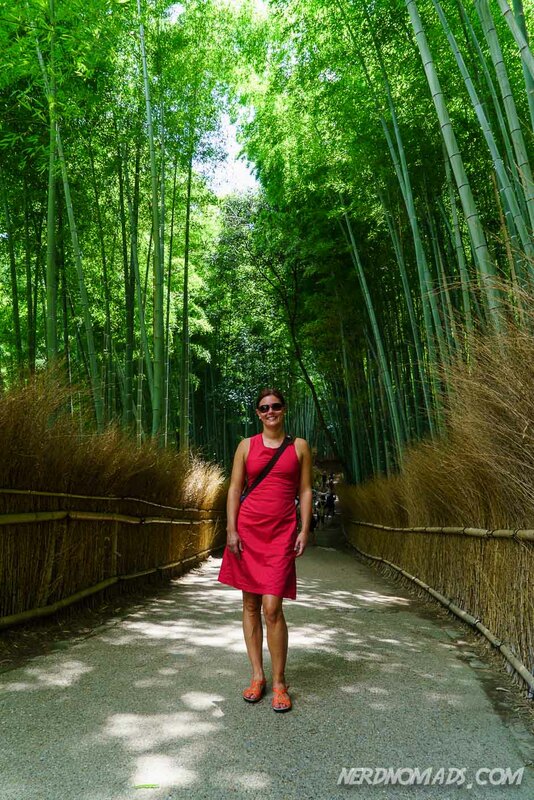 I loved my time at the Bamboo Forest in Kyoto! Such a magical place. You really captured that in your photos! Wow! Great Photos! I was just at the Arashiyama Bamboo Forest two months ago. I found the crowds very trying but it was extraordinarily beautiful. Did you happen to find the foot onsen in the train station there? That was a fantastic treat after walking around all day! Hi Sarah! A million thanks! So happy you liked our photos! 🙂 Yep, the crowds can be pretty bad in the Bamboo Forest, but I guess we were lucky as it was not too packed when we were there. No, unfortunately we did not see the foot onsen in the train station. 🙁 Wish we had though, as it sounds awesome! Beautiful pictures! Ive never been to Japan but I would love to visit the magic forest. Thanks so much for the information, and hopefully I can visit on low season. I would be amazing to be able to wander around this place with no one else. Thank you so much Alejandra! 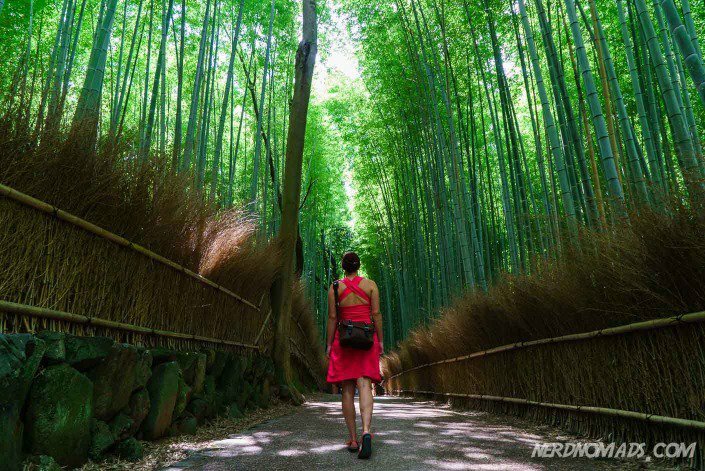 🙂 You should definitely visit Japan and put this Bamboo Forest on your list over places to see in Japan. It is a great country with beautiful nature, cities, temples and shrines! I am not sure if you will ever be able to wander around in this forest completely alone. But if you visit in low season and early in the morning, you will at least be alone some places along the path. I’ve heard of this amazing place before and it’s on my list of places to visit when I eventually go to Japan! 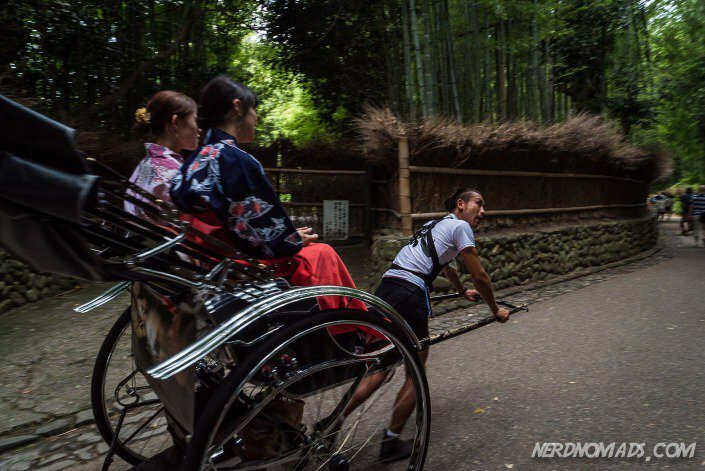 I reeeeaaallly want to go to Japan, so I absolutely loved reading about this! Your pictures are gorgeous, I love how green it is. I’d love to explore the temple, too. A million thanks Lauren!! 🙂 Japan is such a great country!! Everything is so clean and it is an easy country to travel around in as their train system is excellent. I`m sure you will love Japan too!! So much to see, do and eat! I love Japan, and plan on going again next year from my base in South Korea. Thanks a lot Steven!! 🙂 We love Japan too!! Lucky you who live so close to Japan that you can go there easily! Have a great trip next year! My favorite city in Japan – and your beautiful photos framed the city perfectly. I’d go back to Tokyo only to see this stunning bamboo forest, I can’t believe we missed it! It’s a shame it’s so popular (even if I fully understand why) but I wouldn’t care about the crowd in these case, it’s too nice. Yeah, I think that`s the best way to handle the crowds Franca, just pretend they are not there and enjoy the walk through the forest even though you are not alone. This forest is in Kyoto, not Tokyo, and it is amazing! 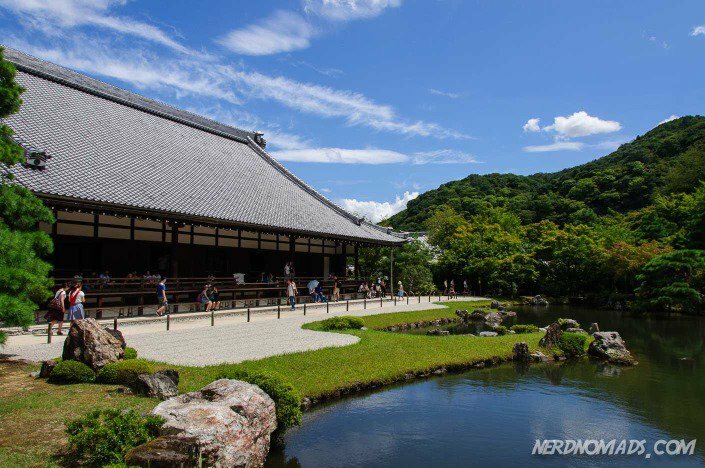 You should definitely visit it on your next trip to Japan! Thanks a million Sumit!! The bamboo grove really is a stunning place!! WOW. I want to go now. This place looks amazing. Loved the pictures! Thank you so much Jess!!! It really is an amazing place!! Oh, the forest looks magical indeed! 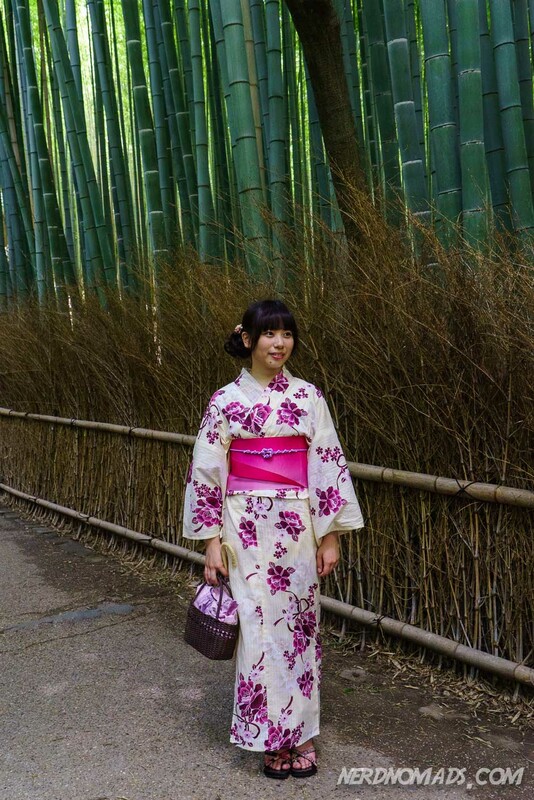 I particularly like pictures of girls in colorful kimono. This whole combination of lush green and vivid patterns looks amazing! Walking around in this forest really felt like a magic moment! Ah, I love kimonos too Elena! 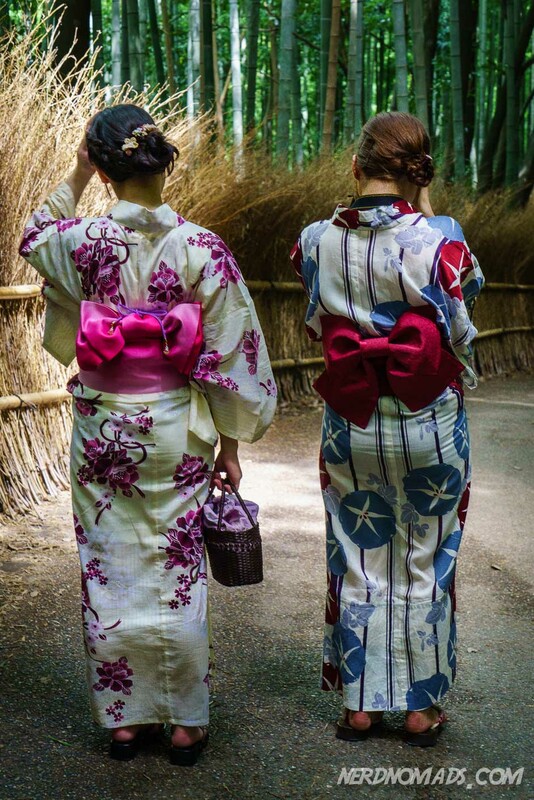 So when these two kimono dressed girls showed up we just had to “stalk” them and take a few shots. 🙂 They were beautiful!!! Looks like a lovely place to explore and you’ve got some really great shots here. Love the sound (pun intended) of the “100 Soundscapes of Japan” Great idea. Thanks a million Kathryn!! The rustling sound of bamboo swinging in the wind is very peaceful and is one of the highlights of a walk through the forest. We loved this forest! 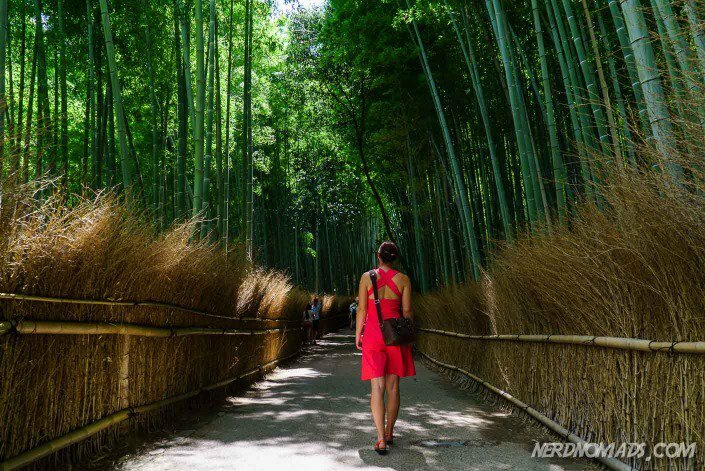 Thank you Maria for the nice words and feelings on admiring moments of Kyoto bamboo forest! 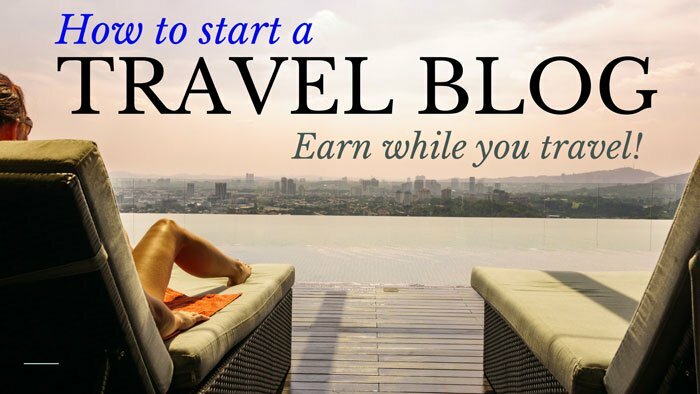 Great pictures and blog! Since the bamboo forest is open 24/7, I was wondering whether it was lit up at night every day, along with the Togetsukyo bridge? I will go when it is not Hanatouro light festival. Yes, the Bamboo Forest in Kyoto is lit up every evening and night, at least the parts that are surrounding the walking paths. 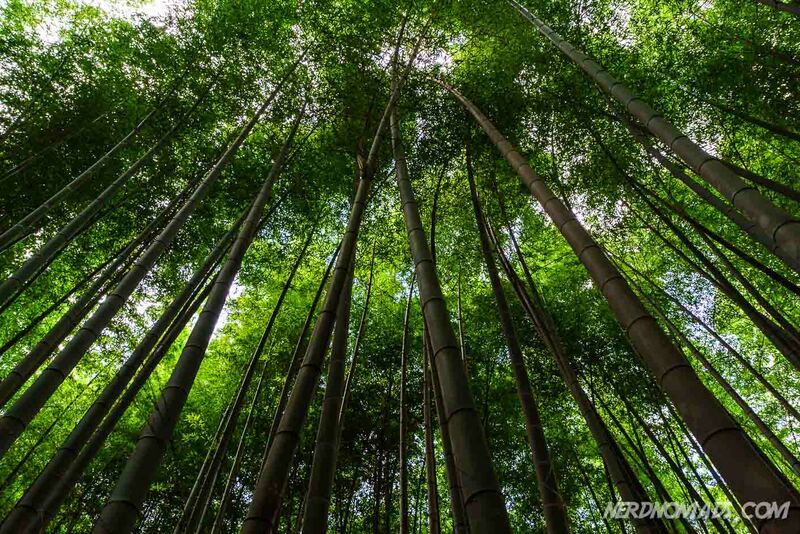 Have a great trip to the Bamboo Forest! 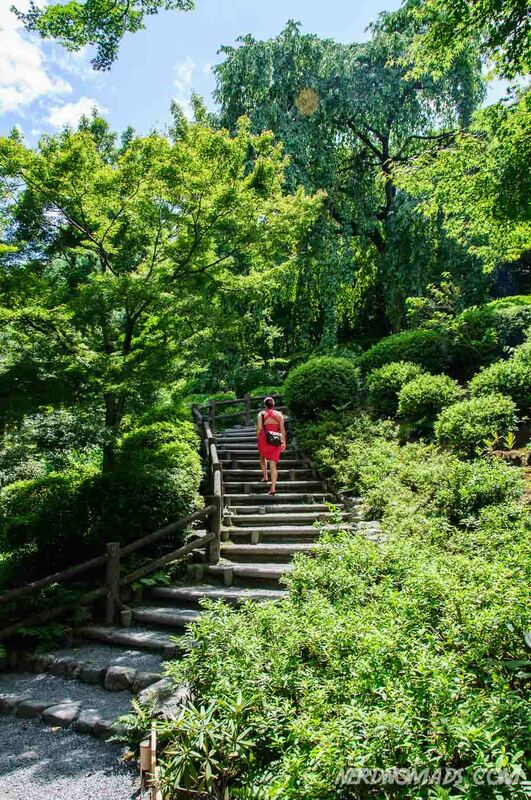 Wondering if you visited the Ryoanji Temple and Rock Garden? Perhaps not as popular or as much of a highlight as the Bamboo Forest? If I go to this place in the early morning , will be ok or not? I think that may be dark because spring in now in Japan .I want to visit only one day full of Kyoto famous place. Yes, it is absolutely best to head to the Bamboo Forest in the early morning. Then you will have the forest almost to yourself. The sunrise is around 05:30 am in the morning in Kyoto now (April), so it will not be dark if you go there around 6. 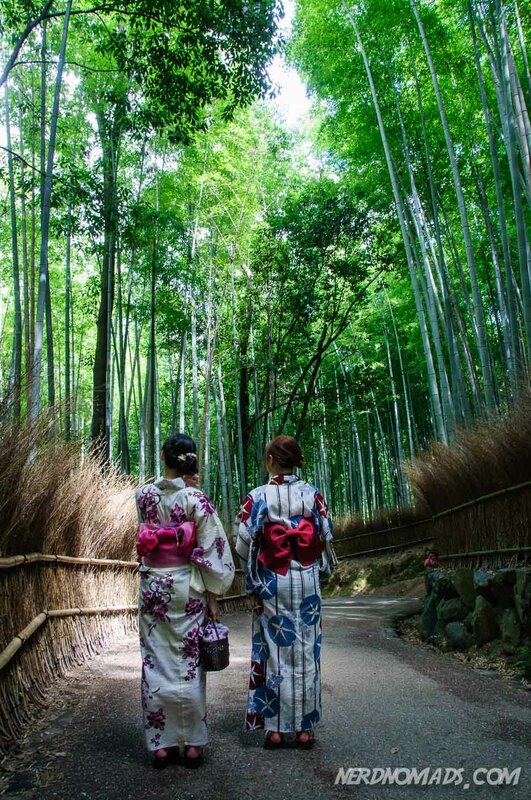 Have a great trip to Kyoto and enjoy the Bamboo Forest!